“Miguel? Miguel Andrango?” The taxi driver’s voice rang out again. More insistent this time. I shrugged. Maybe Ecuador’s most famous weaver wasn’t in. It was Sunday, after all. Finally, after five minutes the side door creaked open. This little, nondescript village high in the hills above Otavalo was home to a man renowned for his skill in creating beautiful textiles. 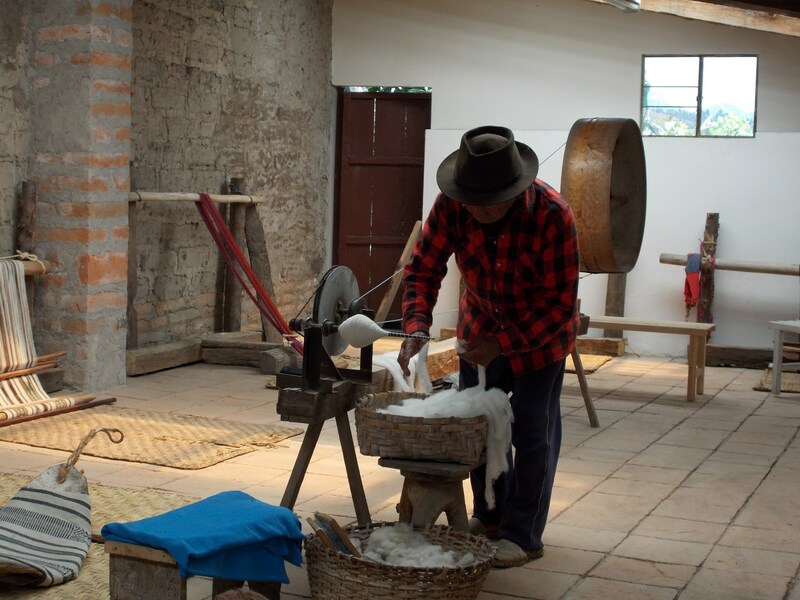 A small inner courtyard led onto a cool tiled room, full of fleece, dyes and a spinning wheel. A backstrap loom with a half-finished rug leaned against the back wall. Miguel must have showcased the process a thousand times, but it was still fascinating to hear how some rugs took three months to finish. A wall full of press cuttings showed his fame had spread far afield, even an invite to speak at the Smithsonian Museum of the Native American in New York. As we headed back down the hill, we passed two coaches, struggling to find the right gear. “Here to see Miguel”, said the taxi driver. I was glad we managed to get a one-to-one audience. Somehow it wouldn’t have been the same in a room full of people.